We are excited to announce we have added another service for our guests and readers. 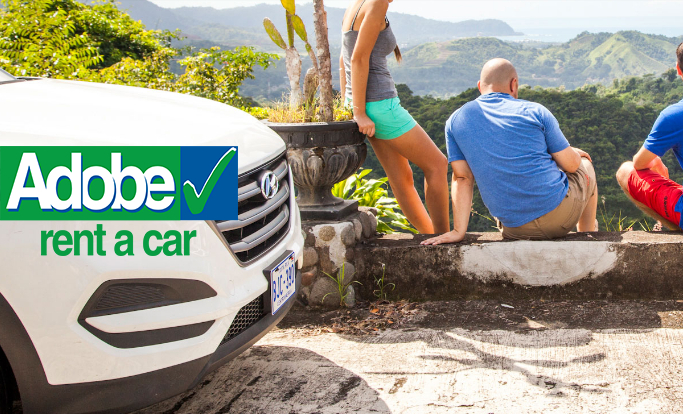 We have partnered with the largest and one of the most trusted rental car agencies in Costa Rica, Adobe Rent a Car! There are many rental car agencies in Costa Rica, including many of the worldwide companies. The biggest problem we have with most of the “other guys” is they never provide a true quote, and only disclose all the add-in fees when you show up to pick up the vehicle. Then they start with a “hard sell” technique to convince you you to buy extra insurance coverage. It doesn’t even matter if you have coverage via a credit card or “elite status” with the same rental car company. They think you don’t know any better. After all, you are in a foreign country, you don’t know local rules, and you’ll believe them. Every now and then you will get a pushy sales type threatening to NOT rent a vehicle to you unless you sign on the dotted line and buy all the “extras.” Plan on at least an hour to pick up your vehicle and get on the road. On the day you return the vehicle, allow a minimum of 45 minutes for these guys to comb over every inch of the rental and close out the invoice. That’s about two hours of your life you’ll never get back. Adobe rates are clear, with no hidden cost. Basic mandatory insurance (covers liability 100%. Collision, thief and rollover coverage is included with a deductible of $1000). Weekly rate is an estimate 6 days of rent and 7 days of basic protection. Additional insurance with a 0 deductible is $17 per day for all vehicle categories. Adobe does not accept credit card insurance. Minimum age to rent: 23 years old with at least 2 years driving experience. Required documents must be presented at the time of the vehicle rental. Use this to search your travel dates. You will see ‘Welcome, MiChunche’ in the right hand corner.